A Few Projects for the Home Metal Shop. I'm no stranger to working with degrees, minutes and seconds and doing geometric calculations. But if you think about it, no matter how familiar you are with the 360 degree system.....it's awkward when you have to calculate precise points when setting up to machine graduations or gear teeth or even just a bolt pattern. The World's military have long since recognized that degrees were not the handiest form of referance, and they instead have divided the circle into 400 units, making each quadrant (1/4 of a circle) 100 even divisions. I'm also a believer in this simple approach, or a similar one using a normal base 10 system and dividing the circle into 10, 100, or 1000 parts. Or even 1,000,000 if need be. You might wonder why someone would want to divide on a machine tool to start with. Basically it's a way of clamping a workpiece in a machine tool, so you can turn it to different circular positions for a repeated machining operation, with accuracy. Making a bolt head, creating spokes on a wheel, setting out a ring of evenly spaced holes, or making a gear. It's a fundamental machining aspect that I'm just starting to understand, and these notes are just a description of my amateur way of solving a problem. One of my early attempts at a simple dividing device was made from and old drill chuck. The drill chuck's tightening collar has 32 teeth and the spring loaded silver lever clamped the chuck in any one of the 32 positions. Machining could then be done on an object clamped in the chuck. Of course it could only divide the circle into 32 parts, or any number that would divide into 32 evenly, but it was good for basic simple jobs. The problem was it wouldn't make a 6 sided bolt head. The need prompted me to purchase a commercial "rotary table" which worked very well, if you take the time to study the graduations and do the calculations. Here it is sitting on my milling table. You can't see it very well, but the rotating table is divided into degrees, and the fine divisions on the knob on the right are in minutes. Trying to figure out where to set these numbers to machine divisions is very difficult. For example if you wanted to clamp a workpiece to the table and drill 50 spaced holes in a perfect circle, where would you set the dial each time when the graduations are 359 degrees, 59 minutes and 60 seconds? 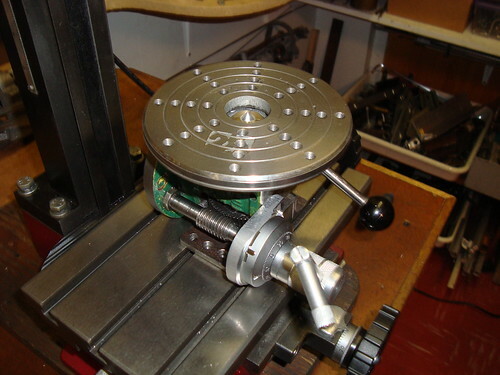 You can buy accessories for commercial rotary tables like this one and dividing heads too....they use a system of drilled plates to position the worm shaft, but they are expensive and hard to use, and no more accurate than the following method. It looks a little complicated, but it's really not. The green painted body is a piece of a broken vise that I machined to make a base that could be clamped to a machine table. It's a simple block of cast iron on a base. A hole is drilled through the vise parallel to the base....I used 15/16" because that was the size of the piece of precision shaft I found in my junk-box. A slot was cut by hacksaw through the body, and a gear was inserted in the slot and clamped to the shaft, using a small grubscrew. 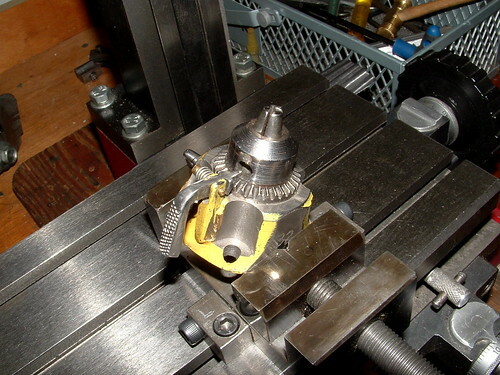 To turn the gear I machined a 10 turns per inch thread on a 1/2" shaft that matched the gear. I measured the gear by spraying it lightly with oil, and then rolling it on a piece of paper. I measured the marks it made and found there was ten marks in one inch and my lathe can cut a 10 per inch thread easily. The knob that drives the worm gear is simply a turns counter, but all you really need is a simple graduated dial that reads from 1 to 10, or from 1 to 100. Here's one that would work with the system. 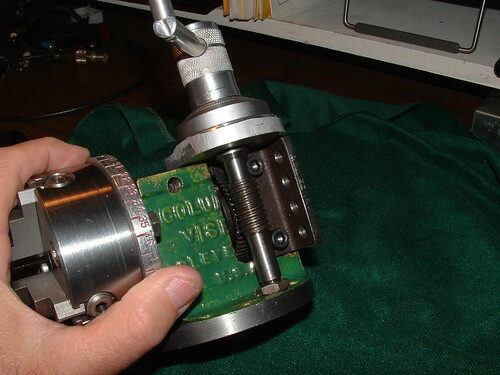 Cut it out and past it on the worm shaft plate, or use a simple drawing program to make your own dial. On the front of the shaft I clamped a round aluminum mounting plate that I machined to fit my lathe chucks....in this case a small 4 jaw chuck is mounted to the plate. 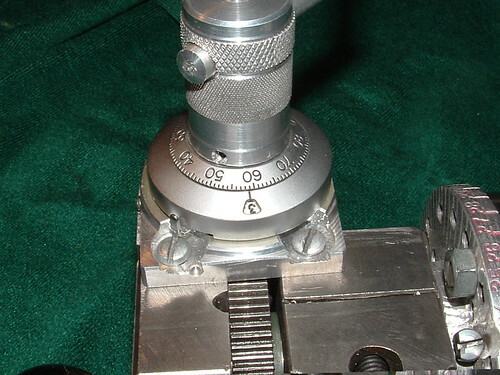 The plate has been marked in 10 degree increments as a referance but they are not really necessary for the dividing head to function and are rarely used. The main body has also been sawed to make a slot on the front half of the body to form a brake. The brake is just a bolt that clamps the slot in the front half of the body tight to the shaft. You can see the lever that drives the brake clamp near my hand in the picture. In this picture you can see the brake slot on the front half, and also the gear and the counter device. The counter is a surplus radio knob that has 100 divisions for one turn and also counts the number of full turns up to 10. 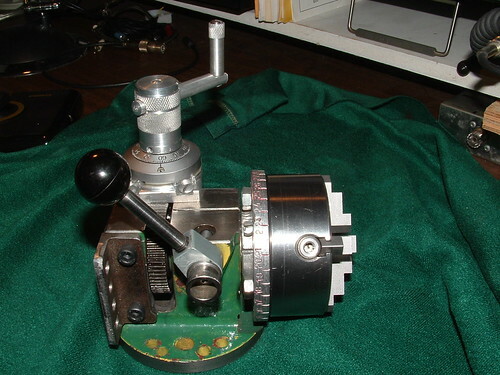 The knob makes it easy to measure rotation of the driving worm gear, but isn't necessary to the function, and instead you could use a simple flat metal circle with a homemade paper dial as shown above. In this diagram you can see all the components of my system above, and below are all the configurations that the system can be used in. 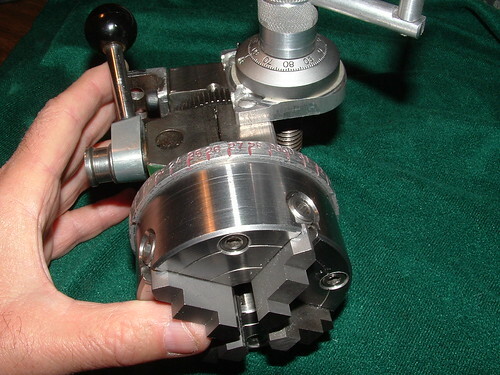 Besides mounting just a lathe chuck, it will also accept a lathe faceplate, a drill chuck, and a gripping handle that can turn the spindle to machine circular slots or bevels. 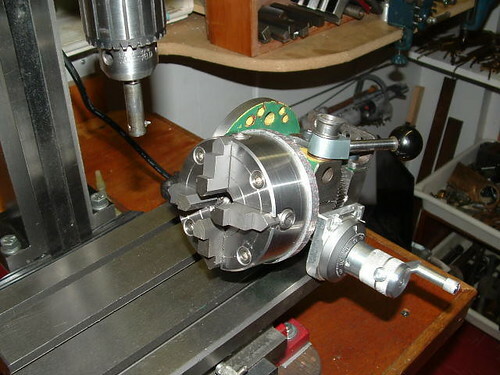 Here's some examples of the dividing head set up on my small milling machine, on the left with a faceplate mounted and used as a rotary table, and on the right with a lathe chuck mounted and in a dividing head configuration for cutting gears. It's a very flexible and useful device and I've made many accurate gears with this homemade tool. This system is not my invention, I've seen it mentioned before , but never really took the time to understand it. The simplicity of construction and use is obvious and the flexibility of using other components besides expensive "worm-gears" with special teeth counts is important. In this case the gear I used was from an obsolete machine and not being designed for a dividing head it happened to have 65 teeth which in a normal dividing head, using degrees, would be difficult to use. Of course the threaded worm drive shaft will turn the gear one tooth for every rotation of the driving shaft, and the calibrations on the driving shaft (on the radio knob or the paper graduations) will divide one turn of the driving shaft by 100....This means that turning the driving shaft 1/100 (one division) of a full turn will turn the lathe chuck 1 turn divided by 65 divided by 100 , or 1/6500 of a turn of the chuck and workpiece. This means we can divide the circle into 6,500 parts with perfect accuracy! In fact with a little extrapolation you can do even better than that. Using this system you can cut any gear tooth count or divide the circle into any segments you want. In use, to find the increment to turn the driving screw you simply take the number of teeth (or points of any kind) you want to machine and divide them into 65. The will give you the increment for 1 division. For example, if you want to cut a 23 tooth gear, take your pocket calculator and divide 65 by 23 (65/23= 2.826087) and 2.826087 would be the increment you would have to turn the graduated knob for each cut. Of course you couldn't read the dial that accurately, but the error would be very small if you round off to 2.826 or even 2.83(more on accuracy later). Using a small pocket calculator you would simply lock your dividing head and make your first cut anywhere you wanted to start, then divide 65 by 23 teeth and get 2.826087. You would unlock the dividng head, advance the calibrated knob 2 full turns plus .826 of a turn (2.826 turns) and make your second cut. Using the calculator in repeating mode (simply hit + then =) it would add 2.826087 to itself and give you 5.65217 for your third cut.....hit = again for 8.47826 for your forth and so on, until you've cut all 23 teeth and the calculator shows a total of 65. For me, it seems simpler than dividing degrees, minutes and seconds....take your old calculator and try a few dry-runs. Since one division of the setting scale is equal to 1/6500 of a turn of the workpiece we can calculate the possible error of the system. For example assume the setting circle was accidently set wrong by one full division (not likely, and easy to avoid), and the workpiece was 2 inches in diameter. The circumferance of the workpiece would be 2pi x R(the radius being 1 inch) or 6.2831852 inches. Since one division of the setting scale is equal to 1/6500 of a full turn, the error of one full division would be 6.2831852/6500 or .0009666 inches. Less than .001 inches (one thousandth of an inch) on the surface of the workpiece. I think that normal operator error would probably be far less than 1/2 division and that means normal errors would be less than half that above, or in the range of 5/10000 inch (.0005). In fact it is easy to judge even smaller increments by eye. This kind of accuracy is far beyond normal workshop requirements and I think can even surpass a system designed on dividing plates where accuracy of machining the plates, and manufacturer tolerance issues would increase the error. As I said before, no special gear ratio is required. You can use a worm gear of any ratio, or even do as I have done and use a surplus spur gear and matching thread to make this device. The calculation simply involves dividing the number of divisions required on the workpiece into the number of teeth on the gear you use, to derive the settings of the worm drive graduations.